While it’s true I’m working my way through copy edits for The White Road of the Moon, which are due back to my editor this coming Wednesday, it is also true that copy edits don’t require anything like the sustained attention required by revision. So I am casting thoughtful glances over my TBR pile, planning to winnow that down a bit over the next couple of weeks. In fact, the main reason I haven’t opened any of the titles below just yet is that I’m still working my way through a nonfiction book: Flight 232: A Story of Disaster and Survival, by Laurence Gonzales. 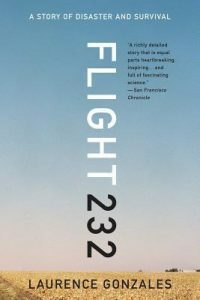 Any of you remember Flight 232? It crashed in 1989, at the Sioux City airport. I was in college at the time, but it was July, so I was home for the summer. I remember watching news coverage of the crash with my family. We were all so amazed that the pilot *almost* managed to get that plane down safely. In simulations, other pilots that tried to handle the same situation – complete loss of all hydraulics – couldn’t get the plane down at all. Nearly 300 people were aboard and about 2/3 of them survived. The plane came in way too fast, and though it looked briefly like everybody would walk away from it, at the last minute the plane dipped a wing, dug that wing into the ground, rose up onto its nose, bounced and pirouetted, and came apart. It’s a tremendously compelling book. Gonzales interviewed practically everyone – the survivors, the air traffic controllers, the people who ran the on-site morgue, the hospital staff, everyone. He intersperses brief sections about the engineering and how the accident happened with all the stories of the people. It’s tough to put the book down, and fiction is just going to have to wait till I finish it. But that doesn’t stop me from making a list of the fiction I most want to get to. So, a Top Ten list – five paper books from the physical TBR shelves, and five ebooks. Sometimes I am mostly trying to get books off the TBR shelves, so I specifically select books I suspect I might not like particularly, in the hope of thinning the pile quickly – taking ebooks off my Kindle or giving away physical books. But not this time. This time, I am selecting books I very much want to read and hope to love. Dominions by Hetley. The first book in this duology, Powers was wonderful and I immediately picked up about four more titles by the author, including Dominions. I will definitely read this one first of all the books on this list, and then decide what to pick up second. The Steerswoman by Kirstein. This has been talked up a good deal, I’ve had it on my virtual TBR pile for a good long time, and it’s time to read it. 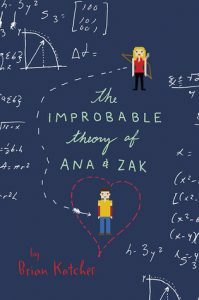 The Improbable Theory of Ana and Zak by Katcher. I heard a reading of a snippet of this book about three years ago, well before it came out, and it was delightful. It’s a contemporary YA and should serve nicely as a foil for all the fantasy on this list. Stained Glass Monsters by Höst. I think it is about time I read this. I am not eager to catch up with Höst’s titles because then I will have to wait for her to write something else. But I am definitely in the mood to read a new-to-me book Höst book, so I pulled this one out of the Andrea K Höst folder on my Kindle and moved it to the top of my TBR pile. After this, I’ll have to decide whether to read Pyramids of London before or after the whole series is complete. Tough decision! Corsair by Cambias. I was thinking of his debut novel The Darkling Sea recently and that made me remember this near-future SF novel. I rather liked the beginning of it, so I moved it up to the top of my TBR pile, too. 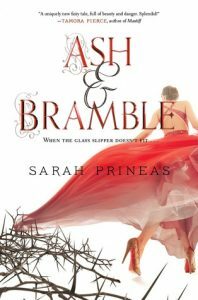 Ash and Bramble Sarah Prineas. I have wanted to read this since before it quite hit the shelves, and now the sequel is practically out and I still haven’t. It’s a fairy tale retelling, or perhaps more a fairy tale deconstruction – Cinderella. It sounds wonderful and I am just *going* to find the time to read it this month, I swear. California Bones by van Eekhout. This is supposed to be a fantasy heist novel. I have only read one other book by van Eekhout, a MG story that turned out to be too young for me, but I have very high hopes for California Bones, which is an adult novel. It’s the first book of a trilogy, but the whole trilogy is out, so about time I read this one. Rose Under Fire by Wein The stars had to align just right for me to pull this off my TBR pile. I love Wein’s work, but her books are intense. I needed time to read a very absorbing book, and I had to be in the *mood* for a very absorbing book. At the moment, both seem to be true. Un Lun Dun by Miéville. I found the beginning catchy, but Miéville is the kind of author who often makes you work pretty hard. I had to be in the mood. I think I am now. Kingfisher by McKillip. Mmmm. I need a lot of really good chocolate and a rainy day and I will just sink into this book. So, let’s see. That’s two secondary world fantasies, four fantasies set more or less in our world, a fairy tale retelling, a contemporary YA, a historical, and an SF novel. A pretty decent selection. Not sure I will read all these in May . . . the odds are probably somewhat against it . . . but they’re definitely all on the top of my TBR pile and I’m sure I will read some of them this month – hopefully a lot of them. I didn’t know about Flight 232, but wow, that was intense just reading the Wikipedia summary. The Steerswoman & Corsair are on my list, too–much for the some reasons. I was disappointed I didn’t hear more chatter about A Darkling Sea, but I’ve lent my copy to several friends. The House Theatre in Chicago just did a play based on Flight 232. Craig and I went to the premiere. Very good – very intense. Some of the survivors were there, although we didn’t stay to talk to them afterwards. I don’t know about Craig, but I was ready to go home and decompress. Making small talk is tough for introverts, especially after going through the emotional wringer. It wasn’t depressing, per se, but very intense. Un Lun Dun is a fun book. I bounce off of most of Mieville’s stuff, but I really liked that one. He’s a frustrating author for me, because it seems like I should love his books (based on who he’s compared to, subject matter, etc), but they generally don’t click for me. Ash and Bramble looks interesting – I’ll have to check it out. Just started Silver on the Road, which I picked up on your recommendation. SarahZ – I know just what you mean about Mieville! On paper (no pun intended), it seems like I should love his stuff, but I just don’t care for his style. I have a similar experience with Charles Stross and Brian Lumley – they’re writing on topics that I usually like, but I can’t get past their writing styles. I wasn’t so crazy about Corsair. It wasn’t bad, but I wouldn’t put it at the top of the TBR pile. Not familiar with the rest. Speaking of genre writing, I just started Deborah Harkness’ Discovery of Witches. It is (yet another) urban fantasy series involving witches, vampires and daemons. (No werewolves yet, but werewolves and demons seem optional to this genre – witches and vampires seem mandatory, as does romantic tension between a witch and a vampire). I was thinking about genre conventions because I was so surprised when Rachel talked about the HEA/HFN convention for romance, but on further reflection, many genres have pretty strong conventions. People are assured of what they’re getting, and they are interested in the variations on the theme. And I’m okay with that. I even tried one of the Paris romances, which I found surprisingly fun. I listened to the audiobook of Laurence Gonzalez’ book Deep Survival. He looks at several different people who’ve been in disasters and puts together a list of qualities that led some people to survive and some not to. It was fascinating. Made me a little paranoid as well. One thing I remember is that the majority of people who survive a disaster are ones who hold on to a sense of humor (and thus a sense of perspective) that helps them not give up even when they see no way out of the situation. I remember reading part of the Harkness in the library, trying to decide if I wanted to drag it home. I didn’t. Mostly it seemed more of the same, as I recall. But a friend of mine is really taken with it and its sequels, so I’ve been considering trying again. I can think of one urban fantasy without sexual tension between the heroine and the vampire, but that’s because the author was sick of it and wanted the more reasonable reaction to vampire: burnburnburn! Although they do talk, as well. A Net of Dawn & Bones if you’re wanting such a change yourself. The book opens in hell. Allen, I knew Craig had seen the play — he told me about it and that’s why I got the book. Amazing that anybody could put together an effective play based on such an event! I’m sure it was *very* intense. I’m trying to figure out if I’d be the kind of person who went to reunions and the play’s premier and all like that, if I were a survivor of such a crash. It seems to me it might be better to close the door on that experience? I know that some people had a lot of trouble with PTSD afterward, and I can sure see why. I hadn’t thought of looking up more of Gonzalez’s books. I think maybe I will. I bet they do work well in audio format. The one lesson I took away from Flight 232 is: Don’t wear synthetic fibers if you might be in a fire. I had no idea how synthetics will melt into your skin, while natural fibers will protect you. Though it makes sense when you think about ironing and how different cotton is from synthetics. Estara, I was thinking that the sequel to Stained Glass Monsters was out. I never hoard sequels, though — unless I hoard them till the whole series is out. For me, it’s usually straight through a series with no pauses. A Net of Dawn and Bones is a great title. I like the idea of reacting sensibly to vampires as predators. Steerswoman! I think you’ll really like it! A sequel to Stained Glass Monsters? Yay! And Kingfisher. Thanks for the reminder; I must get to that one soon. I just re-read Maggie Stiefvater’s Raven Boys series and then the fourth (and last) book, The Raven King. Most excellent. Such good writing! Kim, I’ve just started Kingfisher — it was my physical-TBR turn — but I *swear* that Steerswoman is next on my Kindle. I just ordered The Raven King, but I do think I will have to put it off because I definitely want to start over from the top and read the whole set. Maybe this fall, I hope! And after looking at your post about anime, I’m tempted to try a few, except what I’ll probably end up doing is picking up Moribito: Guardian of the Spirit on DVD and then not ever quite getting around to watching it. Cause it seems like that’s what always happens to my good intentions in that direction. I look forward to hearing your thoughts on Kingfisher. I’m not sure it quite worked in the end, but it’s always such a lovely ride with McKillip. Of course, the Teen was reading over my shoulder speculating loudly aloud and was wrong (which is rare), which may have affected my take, so I’ll reread in a few months (without help) and see what I think then. Oh, one more for your Beauty & the Beast collection to try Troll-Magic by J.M.Ney-Grimm. It’s an East of the Sun version, and I liked it a lot. although not unreservedly. People are intelligent in it. And if you’re looking for animes to try two that the whole family enjoys are Log Horizon – a trapped in a video game world which is about more than fighting the monsters. They start living as if they’re stuck forever and making changes to the world accordingly. There’s only one season out – it hasn’t had a chance to be stretched way beyond the bounds of the story the way so many animes and manga do. And either FullMetal Alchemist series, although we tend to prefer the second (Brotherhood) as having more awesome. Both told the story and STOPPED. The attention to little details that the Teen has gotten me to heed is amazing. You can get some anime streamed through Amazon Prime, which I’m sure you have. although your net connection may not be good enough, from what you’ve said about it. I’m really enjoying Kingfisher, but at the same time I do think it’s not entirely working for me. Beautiful, but, well, confusing. I haven’t had time to sit down and read it straight through, but I keep having a Wait, who’s this again? reaction to many of the characters, as they tend to disappear for long periods and then reappear again. I think it’s one I will enjoy more on a re-read, actually. I can sometimes successfully stream a movie during the winter. And I definitely like the idea of an anime series that tells one story, completes the story arc, and stops.